Our Guild is dedicated to preserving this country's quilting heritage through the education and enhancement of quilt-making skills. Our members have a love of quilting and all things quilt-related and welcome those who have similar interests. Since 1976 has increased from a small group of founding members to 280 and still growing! Scroll down to see the current year calendar of activities. 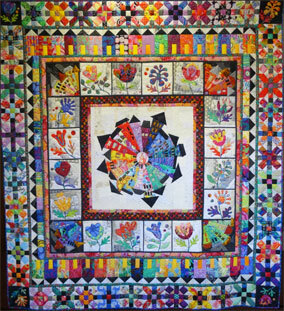 The Santa Rosa Quilt Guild creates an opportunity quilt every year which is raffled to generate operating funds that support the guild and its community outreach. Tickets are available during guild meetings and at various functions throughout the year, such as the Sonoma County Fair and the Moonlight Quilters of Sonoma County Wine Country Quilt Show. Introducing Our Town, New Growth,Resilience, the 2018/2019 Opportunity Quilt presented by the Santa Rosa Quilt Guild. Click here for a more detailed story of Our Town, New Growth,Resilience. The drawing for Our Town, New Growth,Resilience will take place April 4, 2019, during our guild meeting. To learn more about what we offer, and how you can become a member, visit our About Us page. Several quilt-related businesses are members of the Santa Rosa Quilt Guild and many offer discounts. To see a list, click here. Our Guild's Membership Handbook can be viewed online using the link below. Note: This is a large file, please be patient as it downloads. Jan 17 - Program: Inger Blood - "Progression of Free-Motion Quilting"
Jan 16 and 18 - Workshop: "Ruler Quilting"
Feb 21 - Program: Katie Fowler - "The Importance of the Looking Glass and The Rabbit Hole"
Mar 9 - 10 - Sonoma Quilt Show. Held at Vintage House, 264 1st Street East, Sonoma, CA. Mar 21 - Program: Dora Cary - "Fearless Quilting"
Mar 22 - Workshop: "Beads and Strings"
Apr 18 - Petra Keller: "Crumb Box Treat"
Apr 18 - TSW: Jackie Pitts - "Fabric Dolls"
Apr 19 - Workshop: "Don't Sweat the Small Stuff"
May 16 - Program: Colleen Pelfrey - "Life Without a Border Around It"
May 16 - TSW: Sharon Fry - "Yo Yo Refresher Course"
May 17 - Workshop: "Taking the Dye Out"
June 6 - TSW: Ellen Cooper - "Embellishing Canvas Shoes"
Jun 20- Program: Jane Tenorio Coscarelli-"Quilt-A-Beast"
Jun 20 - TSW: Betsy Smith - "Triangle Ruler"
Jun 21 - Workshop: "Altar Quilt - Day of the Dead"
Jul 18 - TSW: Carol Jarvis - "Fussy facing, borders and bindings"
Aug 1 - TSW: Metha Schuler - "Designing with Ugly Fabrics"
Aug 15 - Program: Jane Haworth - "Living a Creative Life"
Aug 15 - TSW: Betsy Smith - "Using Zerntangles in Quilts"
Aug 16 - Workshop: "Love of Pets Fabric Collage"
Oct 17 - Program: Sandra Mollon - "A Personal Journey from Traditional Applique and Piecing into Art Quilt!" Oct 18 - Workshop: "Introduction to Silhouette Art Quilting"